With more games released every year, deciding which one to play next has become increasingly difficult. The complex progression systems and open world design commonly found in modern video games appear to have become a norm, even in some download titles. Sometimes the limitless nature of these types of games can become overwhelming, making it nice to occasionally play a title that is representative of a classic game from simpler times. A game that is perhaps easy to learn, hard to master and can be enjoyed within a few seconds, instead of requiring any long-term commitment. In Super Ping Pong Trick Shot, what you see is what you get. This game - published by Starsign - and developed by Sims (both of Japanese origin) is a basic arcade title mixing the genres of action, sport, and simulation and even adding subtle puzzle elements in order to create an engaging skill shot game. Anyone who considers themselves a trick shot master should find the content in Super Ping Pong more than satisfactory. 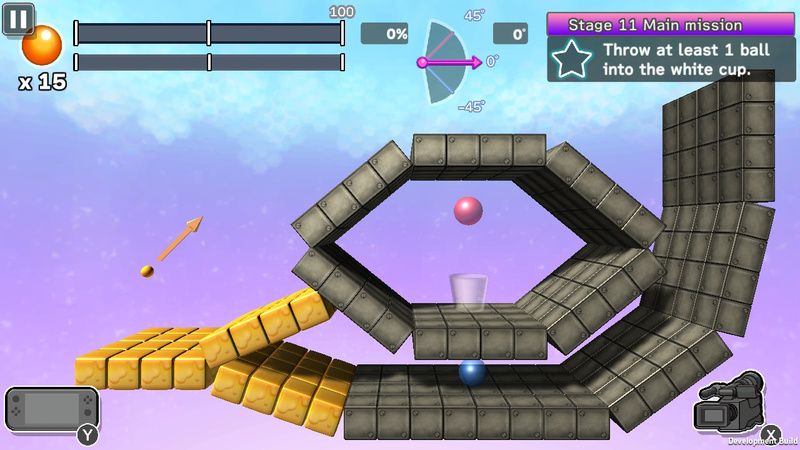 Overlooking the bland visuals - consisting primarily of basic 3D shapes - the task is to fling a ball across a room and try to get it to land in a cup on the other side. The challenge mode – offering 80 unique levels – builds upon this simple concept over time. Eventually there are rooms filled with moving platforms, switches, blocks with special properties and other obstacles that make the main clear-cut objective progressively harder. This is not to forget that there are optional sub-objectives in each level, and that only so many attempts can be made until a stage must be completely restarted – resetting the angle of a shot back to the default position. The physics in Super Ping Pong Trick Shot are sufficient. The ball bounces, rebounds off walls, and flies and floats through the air while using reasonably accurate physics. The launch speed of the ball depends on the level of the power gauge, while the angle of a shot can be adjusted and the camera can also be repositioned. By default, the camera perspective is a side-on view of each level. Later on obstacles, blockades, and even the cup may be out of sight from this perspective, encouraging you to swap to an angled viewpoint. The control options available here include basic button inputs along with gyro and touch controls. The motion control method isn’t bad, nor are the touch controls, but if you want a certain level of accuracy the button input is probably the best way to go. With all of this in consideration, Super Ping Pong Trick Shot becomes more enticing the more it is played. As basic as the premise is, there is a simple satisfaction when acing a level. Sure, you could be off slaying monsters in some extensive fantasy role-playing game world, but this is a quick and fun fix that encourages players to have another go. A lot of the shots don’t always require the player to follow the guidance of a level, either. In certain stages the ball can just be launched up high instead, and with a bit of luck will often fall into the cup. Fluke shots can work out better if a calculated approach does not suit the mood of the player at the time. Additional content prolonging the life of this trick shot game includes a score attack mode and a head-to-head mode. Score attack gives players a number of shots to set the highest score possible on a level, whilst the head-to-head mode has two players taking aim at a single cup to see who can earn the most points within 60 seconds. 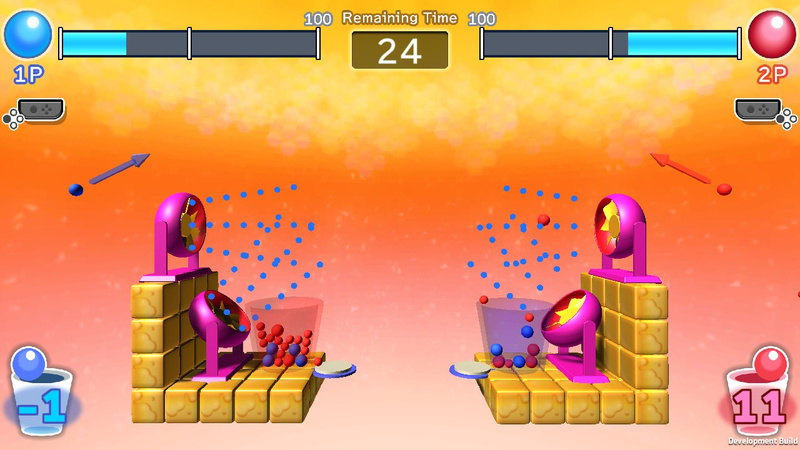 Both players can use items to give them the competitive edge; items like paint cover up the opponent’s gauge and one other power-up allows players to throw multiple balls at once. Together, these two modes are much the same as the challenge mode. Supporting the shot taking is a limited soundtrack that appears to be made up of a handful of songs. 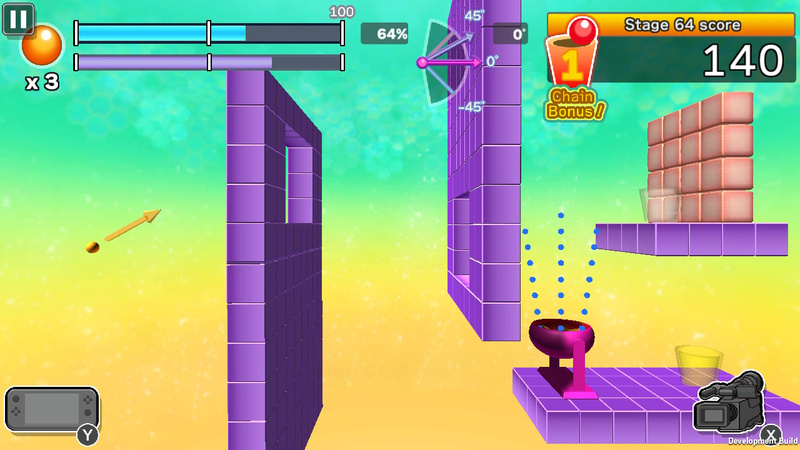 Although not the same level of quality, the smooth and soothing tracks are in some cases reminiscent of the puzzle title Art of Balance. Another aspect of the title that is not particularly impressive is the menu design and in-game overlay. In the game menus there are instruction windows all over the place, and within a level there are too many overly large icons and text boxes. Even the pause menu goes overboard with an excessive amount of text and options. If the user interface was reworked and the visuals were improved – maybe adding some patterns and colourful backdrops – this game might have left a better impression from a visual standpoint. Don’t be fooled, Super Ping Pong Trick Shot is entirely and unabashedly all about trying to get a ball to land in a cup. What it sets out to do, it does right. It’s not particularly exceptional in any way, however the basic concept is addictive enough to overlook the bland visuals and clustered user interface. The range of levels to play across multiple modes and the inclusion of both touch-screen and gyro control options are an added bonus. 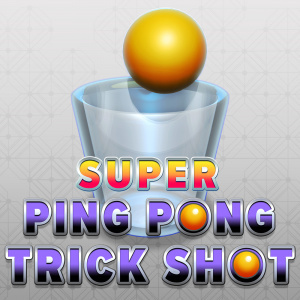 If you want a game that you can enjoy in short bursts in between time consuming titles, Super Ping Pong Trick Shot will do the job. Don’t expect it to work wonders, just enjoy its simplicity for what it is. Guess what game no one's buying because Mario is out. Yep. I pretty much agree. Seems crazy, but I'll probably grab this in a sale. Forget Odyssey, I'm picking up this one instead. @60frames-please Given the type of game this is, it's not really a major concern. In saying that, the frame rate was very smooth on my television and performance-wise the game appeared to have no issues. @Liam_Doolan Got it. I'm just concerned because every video I've watched of it makes it look like it's running at 30. I always feel stiffed if I buy a budget game with simple graphics and they didn't bother to get it running at 60.